Tides for Sandy Hook High @ 0205h (3.8 ft.) & 1438h (4.6 ft.); Low @ 0759h (1.3 ft.) & 2122h (1.4 ft.); Currents in Sandy Hook Channel Ebb: 0548h (1.1 kts. ), 1840h (1.2 kts. ); Flood: 1149h (1.7 kts.) & 0018h (1.0 kts. ); weather from Sandy Hook to Fire Island AM: E winds 10-15 kts., seas 4-6 ft., PM: NE winds 10-15 kts., seas 4-6 feet. AM/PM Showers & Drizzle. As expected, we were greeted this morning with more wind and rain. For now the launches are delayed two hours, but, from the looks of the sea, we’re assuming they will be canceled. While waiting for the final word I responded to a few e-mails. My TAS log is up on the NOAA TAS website, and the pictures Eric and I sent look great thanks to Liz McMahon in the TAS office. At 0945h we heard that launch operations were canceled for the day. So, I went down to exercise and found the room “crowded” – two others were using the equipment. Since the stationary bike was in use I spent 20 minutes on the elliptical. Since I have the time, I’d like to add a little note about life at sea and working on a NOAA ship. Many of the crew I spoke with love their jobs, but cite distance from home as the #1 downer of their NOAA job. I can see why. Phone calls and e-mails at the only real contact points with loved ones. And if you think the dial up internet connection is slow, try sending a snail mail letter when the ship won’t be able to deliver your note to the post office for days. It takes the right attitude to stay on the ship for weeks, and you do need to keep your mind and body busy. Like anything else, the work is hard but the rewards are great! Each night, when I go out on deck to phone Roxann, it’s common to see four or five crew members at some corner of the main deck phoning their families. A sweet time to catch up with the folks at home, and informing the family that we are well and miss them. I am on the THOMAS JEFFERSON for 12 days and really miss my beautiful wife. I can’t imagine what it must be like to stay on the ship for three or four weeks! Sometimes I wonder if even NOAA’s seasoned veterans get used to the time away? While I’m at it, and on a lighter note, there is another item I sadly miss – a beer! Roxann and I are so use to coming home after work and having a drink. However, drinking aboard NOAA ships is forbidden (as it should be). Maybe this is why some of the “boys” have a little toooo much when they go on leave. Feast or famine. So, when asked, “What is the first thing I will do when I get home?” The answer is drink a beer. This rainy afternoon everyone on the ship went through two drills: fire & emergency (one long bell), and abandon ship (seven short bells followed by a long one). The CO and FOO coordinate these activities to keep us on our safety toes, and Bob Schwartz was filming both exercises. For the fire & emergency drill my assignment is to muster (assemble) at the 02 Deck, port side. [That’s two floors above the main deck on the left side of the ship.] I was in my stateroom at the time and was able to grab my raincoat on my way out the door. It was a good thing as the 02 Deck was being lashed with wind and rain. We stayed there about ten minutes – long enough for the fire team to put on their gear and respond to the mock fire. Immediately afterward, the abandon ship drill was held in the main deck hallway. Most ship’s personal gathered with immersion (survival) suits and life jackets. Those without suits acted as inspectors and waxed the zippers for ease of use. All in all, two good exercises. When the drills were done we all assembled in the Mess for a debriefing – what went right and what could be improved. 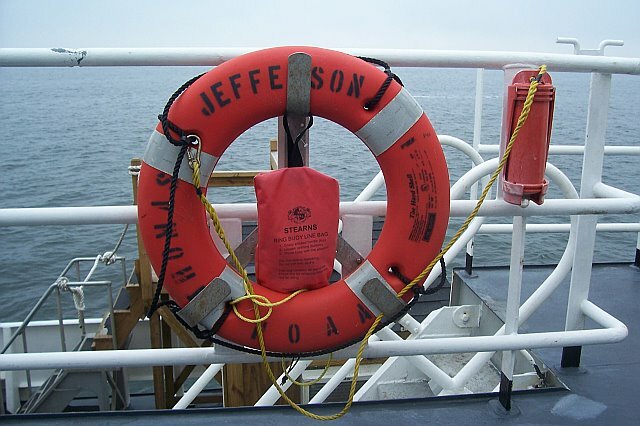 Safety is paramount on a ship like the THOMAS JEFFERSON. As was stated during the debriefing, we are responsible for each other on the THOMAS JEFFERSON and we can’t rely on the local fire department to help us out. The CO and FOO lead a brief discussion, and we soon returned to our task at hand. Dinner was ribs and duck. Good stuff. There are always potatoes or rice and a veggie to add to the meat. And there is a salad bar for the “roughage”, plus dessert. No one goes hungry on the THOMAS JEFFERSON. After dinner Helen gave me a CD of four of NOAA’s sonar Power Point presentations. While most of the sonar theory is over my head, I really wanted the cool pictures that make up most of the presentations. I am sure to use these back at SMCC. Thanks Helen! Another phone call to Roxann – all is well but cold at home – and I am ready to enjoy the evening. With only two plus days to go I need to be sure I have seen and experienced as much as possible. If only the weather would improve! Tomorrow I am scheduled to be on launch 3101 – a first for me. Good night! This entry was posted in 2007, Chuck Gregory, NOAA Ocean Service, NOAA Teacher at Sea and tagged echo sounder, Hydrographic survey, launch, multibeam sonar, new york harbor, NOAA Ship Thomas Jefferson, safety drill, sandy hook. Bookmark the permalink.